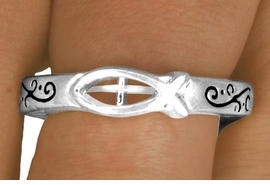 Polished Silver Tone Stretch Ring Read, "Purity" On One Side And Displays A Christian Fish With An Open Center On The Other. Christian Jewelry. See An Additional View Below!